This week’s Throwback Thursday highlights a pioneer that set the tone of sports gaming for a number of years. While only released on PlayStation 2 and GameCube in 2001, NBA Street picked up where NBA Jam left off in 1994. After NBA Jam became a cultural phenomenon in 1993, the franchise’s momentum slowed down after a series of not-so-well-received releases. EA Sports Big was created to capitalize on the new console generation’s hardware and develop games for the exponentially growing alternative and extreme sports crowd. The company had a critical hit with PlayStation 2 launch title SSX, but it wasn’t until June of 2001 that EA unleashed its biggest beast. NBA Street, the first of EA Sports Big’s long line of “Street” sports games, was three-on-three blacktop basketball games to 21 points. All of the 29 NBA teams had five representatives, and players could build their own dream team via a “City Circuit” conquering mode. Gameplay was like butter. Over-the-top physical dunks and absurd takeouts were chained together to boost a trick meter. Goaltending and out of bounds did not exist, so one had to be prepared for maddening blocks on trampoline-park-height jumps. If you amassed enough trick points, you could cash them in for a timed Gamebreaker. Gamebreakers were almost impossible to defend, swung the game by as many as four points, and created an intriguing reward for excessive showmanship. NBA Street was remarkably easy to pick up and play, while experienced players could annihilate newcomers with quick ball movement and the surprisingly deep fakeout system. The game’s over-the-top charm mixed perfectly with the player variety as playing with Steve Francis felt significantly different than Theo Ratliff. City Circuit was the game’s “career” mode. Despite a limited create-a-player feature, it was extremely engrossing when conquering and taking players from NBA teams. Boss battles called for carefully selected teams as each boss excelled at a different component of basketball. For example, Takashi, the most difficult video game sub-boss of the 21st century, was easily eight feet tall and blocked practically any shot. Engaging voice work and a great filler soundtrack made for delightful pick-up games. The joys of blocking a center/power forward with your smallest guards in a moment of desperation were unparalleled. The only rapture that could perhaps come close to this bliss in our lifetime was the bliss felt when multiple blocks were dished out in a single possession. Gotta love that 10-second shot clock. Oh, and Tracy McGrady was unstoppable. As he rightfully should have been. What Today’s Games Could Learn From It? NBA 2K17 does something similar in its Blacktop mode, albeit as more of a palette swap of the main game instead of a fully conceived street mode. Feature-rich NBA 2K17 is a perennial feature innovator, so could the developers feasibly add a single-player mode like City Circuit to their blacktop arena? Given 2K’s chokehold on the basketball market, it’s surprising EA hasn’t attempted some sort of revival for the current console generation. EA’s NBA Jam: On Fire Edition was a well received NBA Jam entry, but the inexplicable lack of roster updates extinguished its momentum. NBA Street: Homecourt, the last entry in the series, was released in 2007 for PlayStation 3 and Xbox 360 and saw a very positive reception. So, why no additional NBA Street titles? Even as a budget digital title, surely EA could recapture some of the magic that created a market for five games in this series. Do you recall the buckets of sweat and smashed controllers that came as the result of a marathon win-by-two match with your buddy? How many times did you try to “Dinner’s Served” in a single game? Are you ready to recognize Tracy McGrady as your lord and savior? The loading screen, in all of its early-2000s glory, is more than enough to bring back unbridled levels of nostalgia. Frantic arcade-style gameplay is refreshing in our current world of sims, and the comically overdone crossover ankle breakers and violent dunks are as fresh as the first time you played the game. City Circuit, while incredibly fun, is not exactly the career mode that most players expect. Rebounding isn’t perfect, steals are rare, and, at times, you’ll find yourself doing the same fakeouts/advanced dunks because of muscle memory. But for a lot of OS readers, NBA Street was a gateway into the wider world of sports video games. 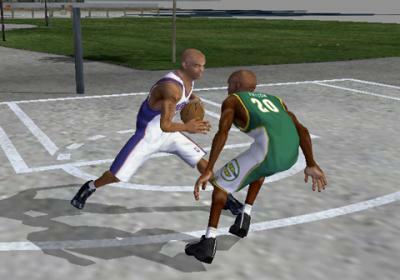 Now that we’re all 15 years older, dust off the PlayStation 2 or GameCube, pop in NBA Street, and serve up some dinner.